This small town on the Great Northern Peninsula in Newfoundland, Canada has lots of moose that roam throughout the town. Driving along these roads you will see moose grazing so one must always be on alert when traveling through Lunaire-Griquet, in fact moose are very common all over Newfoundland. 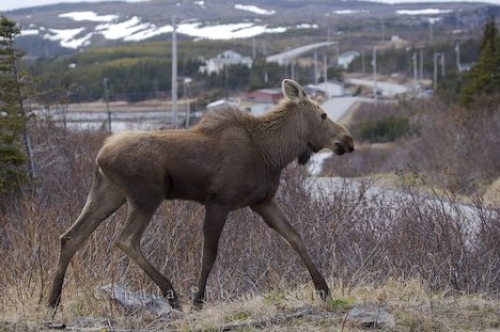 Picture of moose running free in St Lunaire-Griquet on the Great Northern Peninsula in Newfoundland, Canada.